Albert “the Farmer” was a peasant farmer who followed his pious and industrious father’s example. His father taught him many practices of penance and piety that later fructified in a saintly life. At seven, Albert was fasting three days a week, giving the foregone food to the poor. Working at the heavy labor of the fields, Albert learned to see God in all things, and to listen for His voice in all nature. The beauty of the earth was to him a voice that spoke only of heaven. He grew up pure of heart, discreet, and humble–to the edification of the entire village. Albert married while still quite young. At first his wife made no objection to the generosity and self-denial for which he was known. When his father died, however, she made haste to criticize his every act and word, and made his home almost unbearable with her shrewish scolding. “You give too much time to prayer and to the poor!” she charged; Albert only replied that God will return all gifts made to the poor. In testimony to this, God miraculously restored the meal Albert had given away over his wife’s objections. Finally, softened by Albert’s prayers, she ceased her nagging and became his rival in piety and charity. She died soon after her conversion, and Albert, being childless, he left his father’s farm to make a pilgrimage to Jerusalem and Rome. Stopping at Cremona, Italy, at harvest time, Albert went to work in the fields. He soon earned the name of “the diligent worker.” His guardian angel worked beside him in the fields, and, therefore, twice the work was accomplished that might be expected of one man. Weighing in his grain at the end of the day, Albert always received twice as much in wages as the other workers did. Though he gave this to the poor and kept nothing for himself, jealous companions determined to annoy him. Planting pieces of iron in the field where Albert would be working the next day, they watched to see him break or dull his scythe. Miraculously, the scythe cut through iron as it did through the grain, never suffering any harm. In Cremona Albert’s poverty was also a witness to a group of heretics there who boasted of their own poverty. In all, Albert visited Rome nine times, Santiago de Compostela eight times, and Jerusalem once. He worked his way, giving to the poor every penny he could spare. His pilgrimages were almost unbroken prayer; he walked along singing hymns and chanting Psalms, or conversing on things of God with the people he met along the way. Appalled at the suffering of pilgrims who fell ill far from home and the penniless, Albert determined to build a hospital for their use. This he actually accomplished by his prayers and diligent work. In 1256, he met the Dominicans. 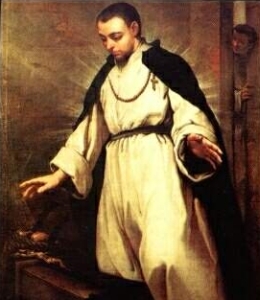 Attracted by the life of Saint Dominic, Albert joined the Brothers of Penance, which later became the Order of Penance of Saint Dominic, and continued his works of charity in his new state. As a lay brother he was closely associated with the religious but lived in the world so that he was able to continue his pilgrimages. At home, he assisted the Dominican fathers in Cremona, working happily in their garden, cultivating the medicinal herbs so necessary at the time, and doing cheerfully all the work he could find that was both heavy and humble. Falling very ill, Albert sent a neighbor for the priest, but there was a long delay, and a dove came bringing him Holy Viaticum. When he died, the bells of Cremona rang of themselves, and people of all classes hurried to view the precious remains. It was planned to bury him in the common cemetery, outside the cloister, as he was a secular tertiary, but no spade could be found to break the ground. An unused tomb was discovered in the church of Saint Matthias, where he had so often prayed, and he was buried there. Many miracles were attributed to him after his death, and the farmer- saint became legendary for his generosity to the poor. Representation: In art, Saint Albert is a farm laborer cutting through a stone with a scythe. He may shown be shown (1) when a dove brings him the viaticum, or (2) with a dove, Host, and censer near him. Albert is the patron of bakers and day-laborers, and is venerated in Cremona, Bergamo, and Ogna.